Arianespace's Jan. 25 Ariane 5 launch followed bad instructions that sent the rocket farther south than intended. Credit: Arianespace video still from Jan. 25. WASHINGTON — The Ariane 5 rocket that deviated from its expected flight path Jan. 25 and lost contact with ground control was fed the wrong coordinates, according to the independent commission Arianespace tasked last month to find out what caused the close call. Both telecommunications satellites onboard the rocket safely reached orbit despite the flight anomaly but will need to burn additional fuel to reach their perch some 36,000 kilometers above the equator. The European Space Agency-led independent enquiry commission concluded that Ariane 5’s inertial navigation system was fed the wrong azimuth. That sent the rocket 20 degrees off course, causing alarm nine and a half minutes into the mission when Ariane 5 left the view of the ground station monitoring its intended path. Evry, France-based Arianespace, operator of the Ariane 5, said in a Feb. 23 statement that the cause of the launch hiccup is now “perfectly understood,” and corrections are being immediately implemented by Arianespace and Ariane 5’s manufacturer ArianeGroup. 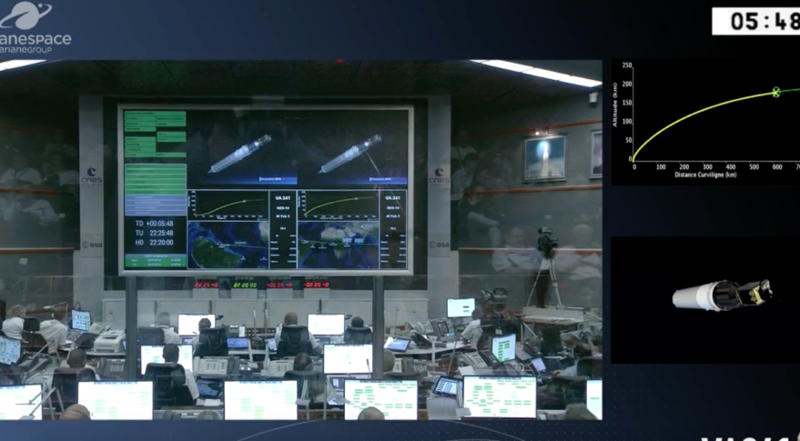 SES-14 and Al Yah-3, the two satellites aboard the rocket, are both healthy but will need extra time to reach their operational orbits and enter service. Luxembourg-based SES’s SES-14 will need an extra four weeks of orbit raising with its electric propulsion system on top of the six months initially planned. YahSat of Abu Dhabi, UAE, said Feb. 20 that its Al Yah 3 satellite, equipped with a hybrid chemical and electric propulsion system, will reach geostationary orbit in June. The independent enquiry commision, led by ESA inspector general Toni Tolker-Nielsen, submitted its conclusions Feb. 22. NASA, which is entrusting Ariane 5 with next year’s launch of the $8 billion James Webb Space Telescope, participated in the investigation. The commission said Ariane 5 had incorrect azimuth information directing the rocket to 90 degrees instead of 70 degrees, a course Ariane 5 began following “from the initial seconds of flight.” Standard quality checks missed the wrong mission parameters. Future launch campaigns should scrutinize mission parameter data more carefully through better document verification and additional consistency checks, the commission advised. Prior to the Jan. 25 launch, Ariane 5 had completed 82 consecutive launches without incident. Arianespace’s next mission is a March Soyuz launch of four O3b satellites for SES, followed by an Ariane 5 carrying Avanti’s Hylas-4 satellite. The campaigns for both missions remain unchanged, Arianespace said.